Here’s a guide that outlines how Mead Gallery’s events and exhibitions, and The University of Warwick’s Art Collection can help you achieve your curriculum’s objectives. Art, craft and design embody some of the highest forms of human creativity. A high quality art and design education should engage, inspire and challenge pupils, equipping them with the knowledge and skills to experiment invent and create their own works of art, craft and design. As pupils progress, they should be able to think critically and develop a more rigorous understanding of art and design. They should also know how art and design both reflect and shape our history, and contribute to the culture, creativity and wealth of our nation. produce creative work,exploring their ideas and recording their experiences exploration and discussion of the way that other artists have explored ideas and recorded experiences; the opportunity to produce creative work inspired by the artworks that they encounter on campus. become proficient in drawing, painting, sculpture and other art, craft and design,techniques analysis of strategies and techniques used by artists, some of them innovative and unusual. evaluate and analyse creative works using the language of art, craft and design open discussion of the artworks that they encounter on campus with specially trained students, staff and artists. know about great artists, craft makers and designers, and understand the historical and cultural development of their art forms. an exploration of the post-war impetus to put modern and contemporary work into the public domain for education, cultural enrichment and enjoyment; an examination of some of the key movements in British and international art since the 1950s. to use a range of materials creatively to design and make products a Colour Trail and a Sculpture Trail that include examples of artworks made from a wide range of materials and using varied techniques eg poured paint. to use drawing, painting and sculpture to develop and share their ideas, experiences and imagination trails that include artworks that describe a wide variety of things from emotions to the natural world, memories and human activities like play and travel. to develop a wide range of art, and design techniques in using colour, pattern, texture, line, shape, form and space a Colour Trail that centres on these ideas, using specially trained students, staff and artists to discuss major works by artists such as Patrick Heron and Ian Davenport. about the work of a range of artists, craft makers, architects and designers, describing the differences and similarities between different practices and disciplines, and making links to their own work The Mead Gallery and the University of Warwick Art Collection together present the work of a wide range of artists.,We also have a teaching collection of ceramics, assembled between 1950 and 1970 to train primary school teachers in different clay techniques. about great artists, architects and designers in history. the chance to see first-hand the work of major artists from the past sixty years and to discuss it. Pupils should be taught to develop their creativity and ideas, and increase proficiency in their execution. They should develop a critical understanding of artists, architects, and designers, expressing reasoned judgments that can inform their own work. to use a range of techniques and media, including painting; to increase their proficiency in the handling of different materials close analysis of a wide range of techniques and strategies used by major artists to express their ideas.,These include an important collection of abstract paintings from the 1960s, juxtaposed with a huge commissioned painting for a two storey wall. to analyse and evaluate their own work, and that of others, in order to strengthen the visual impact or applications of their work trained students, staff and artists to lead analysis of artworks and discussion of responses to them. about the history of art, craft, design and architecture, including periods, styles and,major movements from ancient times up to the present day an exploration of the post-war impetus to put modern and contemporary work into the public domain for education, cultural enrichment and enjoyment; an examination of some of the key movements in British and international art since the 1950s. the development of the pupil’s ability to make personal and informed choices in unaided work. The exhibition programme at the Mead Gallery presents a curated group of works either by a particular artist or group of artists. Pupils are able to develop their own responses to the works and to gain insight into the strategies and techniques used by other artists. An important element is the idea of curation and how works are selected for the exhibition; just as they will curate their own submissions to examiners. Curators can give guided tours, often discussing the issues and decisions that informed the selection of works. The autumn exhibition examines a precise period in sculpture when making skills were prioritised. 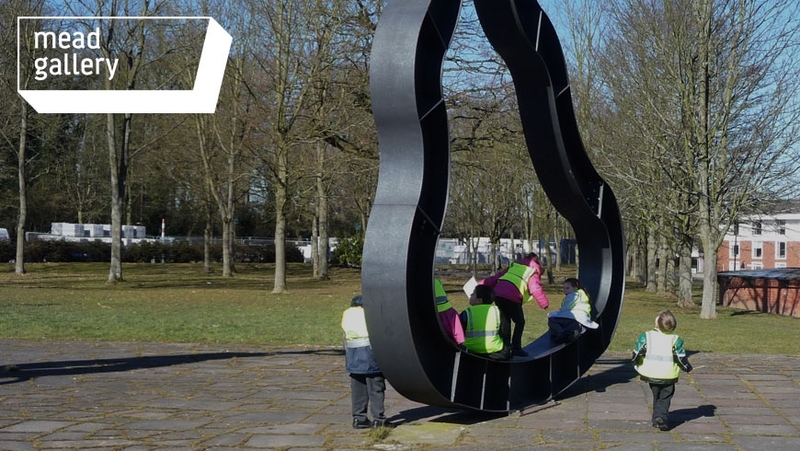 This can be juxtaposed with a wider group of sculptures from the 1960s to the present that are on open display across campus and identified on the Sculpture Trail. We have sculptures on campus by Avtarjeet Dhanjal, Alec Finlay, Atsuo Okamoto, David Nash and Peter Randall-Page that reference the natural world. In addition, we have two historic woods, a newly planted wood that aims to increase bio-diversity, a Jam Grove, student allotments and wetlands on campus. We can work with you to create a day long series of different experiences that inform and stimulate creative practice.